PRODUCT DESCRIPTION: Light smelling disinfectant, similar in smell to Lysol spray, but commercial in grade. Designed for strong virus and bacteria this ready to use aerosol is handy for quick applications when contaminants are first found. Great for small jobs and spot treating cleanups when dealing with an ongoing problem. RATE OF APPLICATION: The aerosol is not designed to go far compared to the BBC liquid. 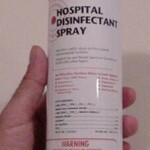 Use the liquid for large jobs; keep the Hospital Disinfectant available for spot treatments and quick applications. Both do the same thing but applied differently.